Byctiscus betulae, copyright James K. Lindsey. 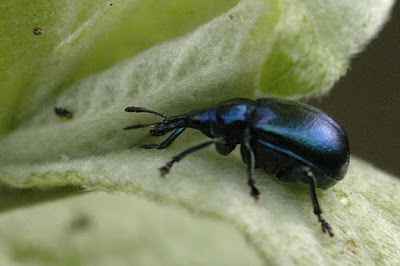 The Attelabidae are a group of weevils whose larvae develop in rolled leaves or developing shoots. Characters (from Lawrence & Britton 1991): Oblong to slightly elongate, narrowed anteriorly and subglabrous or clothed with decumbent and erect hairs. Rostrum short, flattened and apically expanded or long and narrow; antennae straight, inserted dorsally at base of rostrum, eleven-segmented with three-segmented club; gular sutures fused; mandibles usually exodont (with outwardly projecting teeth); labrum not visible; maxillary palps well developed, but labial palps may be highly reduced; prothorax much narrower than elytral bases, without lateral carinae; fore coxae projecting, trochantins concealed, fore coxal cavities externally and internally closed; mid coxal cavities contiguous or narrowly separated, laterally closed; tarsi pseudotetramerous, tarsal claws connate at base; pygidium partly or completely exposed; first three or four ventrites solidly fused. Larvae relatively short and broad, strongly curved, somewhat narrowed at each end and very lightly sclerotised; head strongly or only slightly retracted; labral rods present; most abdominal terga with two transverse folds (sometimes indistinct); some Rhynchitinae with bands of tergal asperities. [L01] Legalov, A. A. 2001. Revision der holarktischen Auletini (Coleoptera: Attelabidae). Russian Entomological Journal 10 (1): 33–66.